The date is July 25, 2010. The place is Milan, Piazza Duomo. For the first time an international class triathlon will be entirely held in the historic center. The dream became a reality thanks to the determination and organizational skills I AM Sports Events. Thanks also to the municipality of Milan, which has identified further opportunities in the triathlon to attract visitors and spread a international sports city. The idea of three guys who drive I AM Sports Events, big fans of triathlon, was created by the ambition to see their hometown stage a World Cup test (WCS) Triathlon Olympic specialties launched in 2008 with the Beijing Olympic Games and with its 1.5 km swim, 40km bike and 10km run is gaining thousands of fans and the growing curiosity of the media. Why Milan? The city offers all the facilities needed to support the three sports, to manage the flow of participating athletes and all the logistics that a race of this level requires. The Milan Course, studied with the police to ensure spectacular evidence causing minimum inconvenience to the citizenry, is developed entirely on city soil and sees the start from the Darsena and the swimming section along the Naviglio Grande, the bike spit starting from Via D'Annunzio Cairoli with a circuit around the Parco Sempione and finally the run split from Piazza Cairoli Dome with another ring around the historic city center. 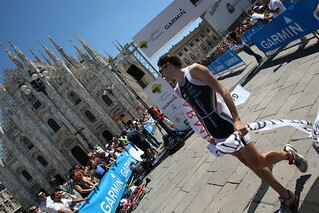 This project could be a great opportunity to try to get among the best events on this distance in the world (along with Sydney, Seoul, Madrid, Hamburg, London, Kitzbuhel, Budapest), but especially for bringing the many triathletes and Milan Italians to a wonderful and growing sport, exploiting the opportunity to bring in Milan the best of the sport worldwide.